I tend to have leftovers whenever I make a big meal. Especially when it involves potatoes or yams. I usually make extra because I am not always sure how much they will yield and leftovers seems like a good idea at cooking time. But life gets busy and getting around to eating them sometimes happens but not in quantity I anticipated. I have come up with quite a few recipes that use leftover yams, some savory, but my favorites involve desserts. I thought I would share a favorite cookie using yams with you, because you may have some left over this time of the year. 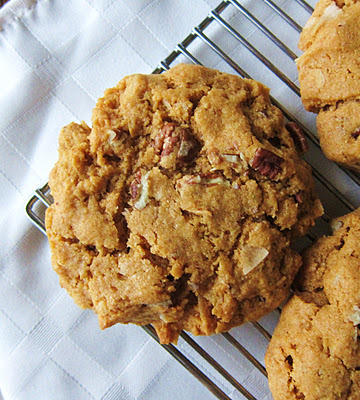 These easy to make, gluten free cookies are a great way to get a yam or sweet potato hater to enjoy them. You will never look at leftover yams the same again! These are especially good if the yams have been roasted. Are you looking for a creamy, satisfying soup without all the dairy? Look no further than this root vegetable soup recipe. 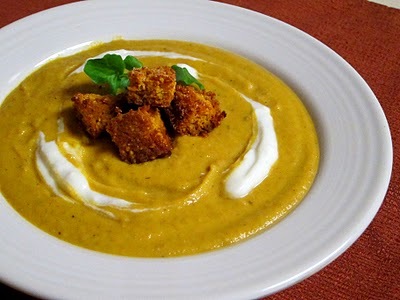 I came up with it because someone asked me to create a creamy dairy-free soup that was still delicious. The best part is it is filled with nutritious root vegetables which are roasted to give it a lot of flavor. It was delicious on its own, but I topped it off with toasted corn bread croutons and vegan sour cream to make it extra special. This would be perfect with a salad or served in small bowls before a meal. The holidays are a time for entertaining. This busy season of our lives is full of social gathers around the same theme of food. One area of party planing that typically gets neglected is the beverage department. Soda, coffee and water are the typical offerings. Here is a delicious non-alcoholic beverage that is unusually tasty. This spritzer is a beautiful addition to a holiday spread when served in a glass pitcher. So if you are looking for a lightly, sweet alternative to the “same-ole, same-ole”, you’ll enjoy this colorful showstopper bursting with sweetness and healthy dose of 0mega-3s. If you want to add a little kick, add 1 oz. vodka to each glass. 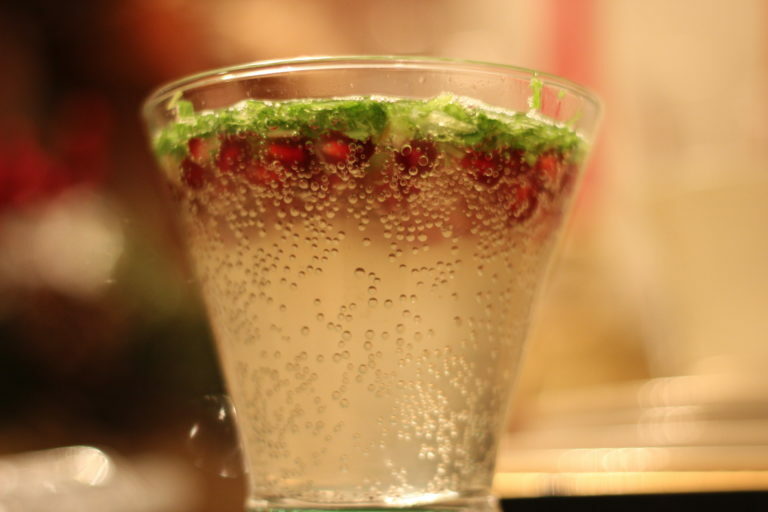 *Some guests may prefer the drink to be muddled while others will enjoy eating the seeds and basil leafs. In the deli department, there are many customer favorites. But one that always stands out to me are the beet salads. If they are missing from the case, people always ask when they are going to be made again. I do not blame them, as beets are one of my favorites as well. Its lovely color, sweet flavor and nutritional density make it very desirable. One of my favorite ways to serve them is with citrus fruits, the flavors are perfect together. 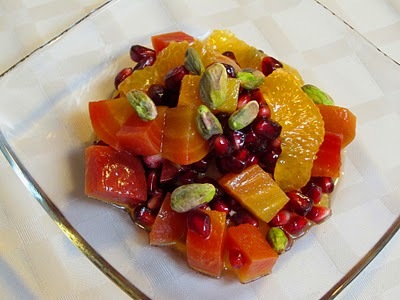 So, I decided to share with you one of my favorite winter salads featuring red and gold beets! It is a show stopper that I love to serve to guests. Minnesotans are known for their Swedish and Norwegian ancestry. My family is no exception. We have our traditional Swedish meatball dinner every Christmas that has been passed down over five generations. 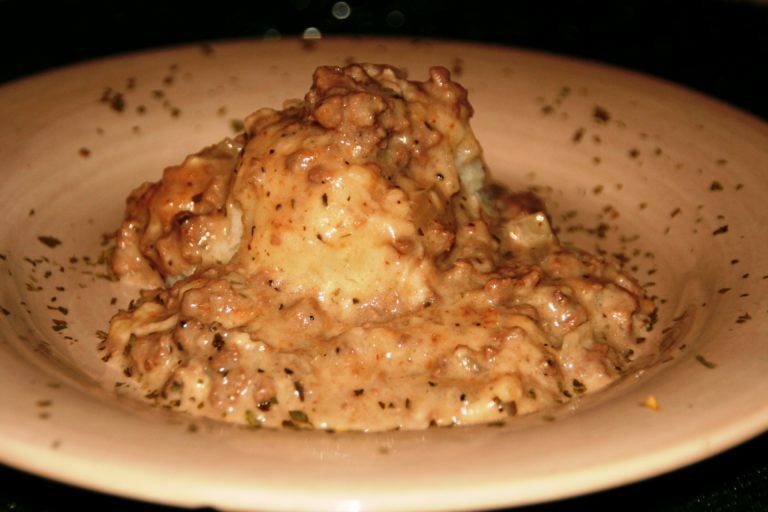 The simplicity of the ingredients is what I believe is what makes the meatball and gravy so delicious. My husband especially loves this meal. On vacation in Florida, my grandma, who lived there, made the traditional family dinner like only she could make it. The thing of it was she made a 38 quart size pot of just Swedish meatballs and gravy for 7 of us. She didn’t know how to cook small portions. The motto in our family always was “well you gotta eat.” After we had all dished out our plates, it looked at is if no one had eaten. My grandma found great joy in cooking and people’s appreciation for her meals. We all knew it too, so my husband in his attempt to show his gratitude ate 17 meatballs a little bigger than the size of a golf ball that year. We all laugh about it now. While he won’t be making an encore of that day, he loves it when I make Swedish meatballs, but it is very time consuming meal. I have since made an easier version that can be made for a everyday dinner. It is sure to bring happiness and satisfaction to your meat and potato eater in your family. The holidays always make me think about Christmas cookies. Every year, my mother and I would make at least 12 different types of cookies. Spending time with her making and picking the types of cookies in the kitchen was one of my favorite seasonal traditions. 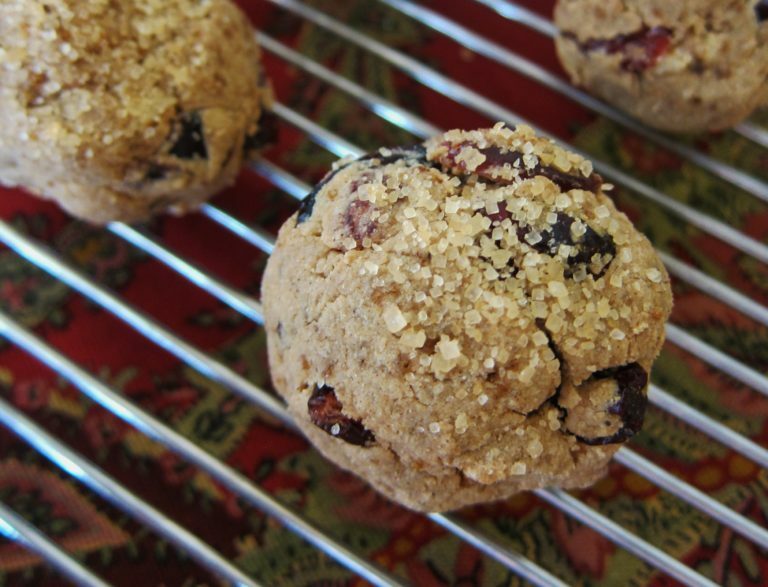 One of her favorites was a cranberry shortbread cookie. I have since lost the recipe, but I decided to create a gluten-free vegan version. I added a bit of spice to them in the form of cinnamon, nutmeg and cardamom along with some walnuts for crunch. Top them off with a bit of crunchy turbinado sugar on the outside for sparkle. They smell wonderful while baking. and they are perfect sweet little bites to have at a holiday party! With the hustle and bustle of the holidays, who has time for cooking, especially prep time? It’s nice to have some simple but delicious sides to serve with those sometimes intense main dishes. This recipe is a family favorite; fresh fennel salad is easy and tasty. Before I went vegan, I made the salad with simply fennel, pine nuts and parmesan. The pomegranate seeds were the alternative to the parmesan. It makes the salad vibrantly beautiful and adds a nice tart sweetness. This side acts as an art piece on the dinner table and gets guests attention. 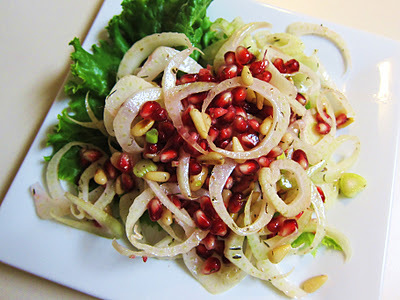 All this talk about fennel and pomegranate makes me crave our Christmas meal. Cut pomegranate into quarters. In a medium size bowl, fill with water. Place one quarter of the pomegranate into water and slowly pull out seeds. Repeat with all quarters until all of the seeds are removed. Drain the water from the bowl. If you are like me, you are probably looking for quick and hearty dinners to serve that require little effort. Afterall, it is not unusual to come home and just want to relax; dinner is the last thing on your mind. I recently threw together a quick and easy pasta dish with leftover pumpkin that turned out delicious. It requires little prep time, just cooking the pasta while you make the sauce. 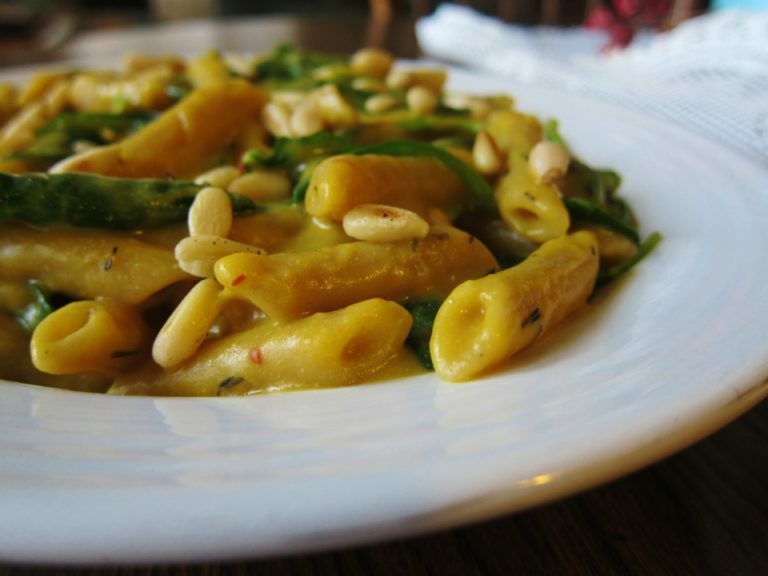 This vegan dish tastes rich and only contains healthful fats. Try it out on a night where you want something tasty but don’t want to spend an hour on dinner. Need a recipe to move the leftover turkey in the fridge? 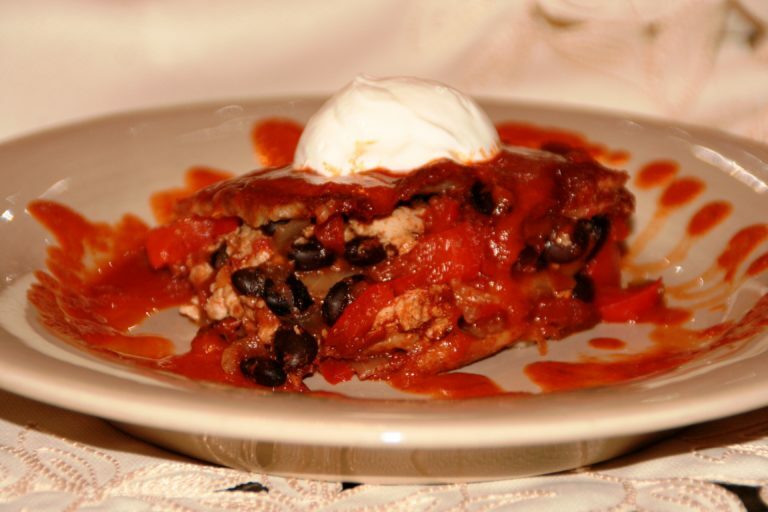 This recipe is a tasty diversion from the traditional turkey dinner. This easy-to-do entree is great for the whole family whose spice index varies. Like tacos, add as many or what you have on hand to this dish. It is very versatile. Thanksgiving is fast approaching, and so a lot of people seem to be looking for recipe ideas for the meal. For dessert I thought it would be fun to share another idea besides pie that isn’t too hard to prepare and requires no baking. Pumpkin mousse! 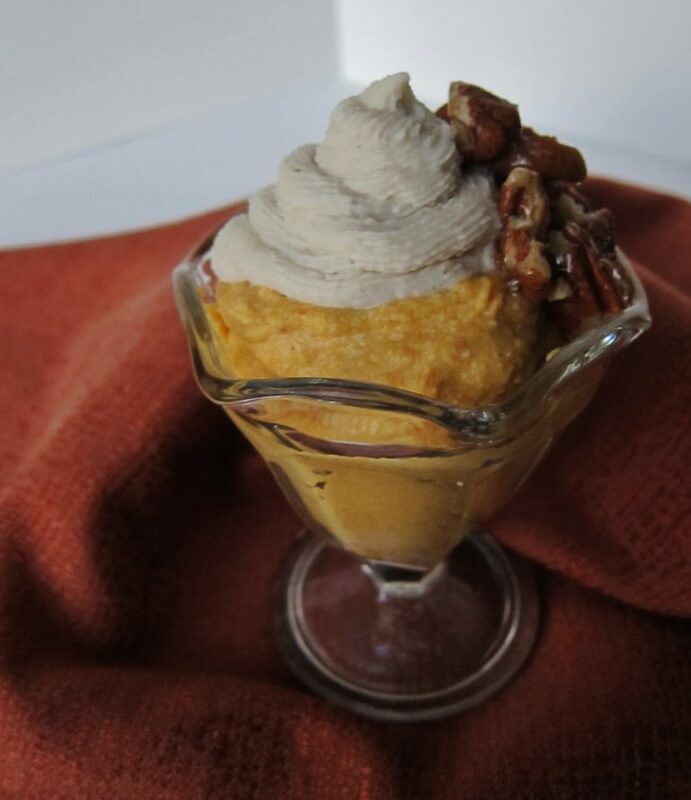 I often times make a raw coconut cashew cream for desserts, and I thought it would be delicious folded into pumpkin puree for a light mousse. It reflects a light pumpkin pie and would be beautiful to serve after a Thanksgiving dinner. Plus, it is vegan and gluten-free, so if your guests fall into those categories, this would be the perfect option!